Ever wished you could play a gig in your PJs? Imagine Your Music in Virtual Reality! Are you a musician looking to expand your audience? Do you want to build an international fan base and network with other musicians? Would you like to be on the cutting edge of the next revolution in social media, playing live to a global audience at any time of day from your own home or studio? We’ll show you how! Second Life is a 3D virtual world designed by its members. Everything you see is user created. 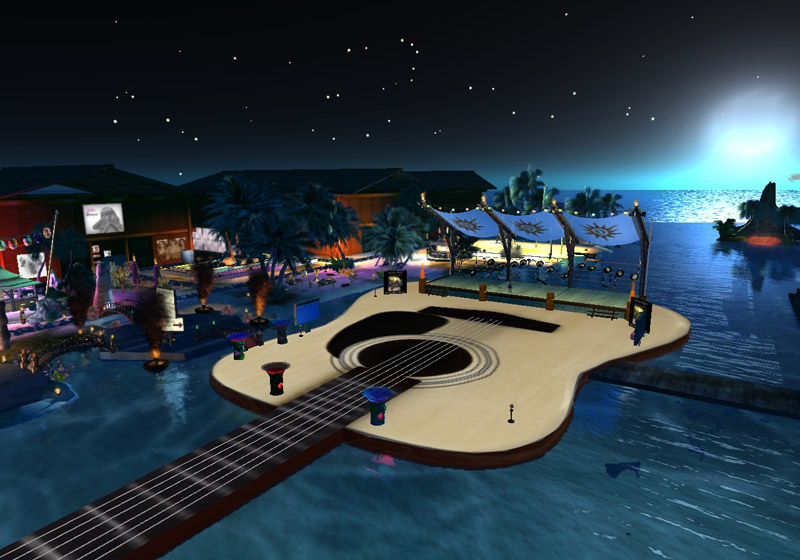 Second Life has a vibrant, global live music scene with events 24 hours a day. All genres are represented, including rock, folk, country, jazz, Broadway, and more. Performers typically play for one hour, and venues range from clubs to outdoor pavilions to ballrooms. You might even find yourself performing in a space station, a treehouse, or a castle. Stream audio and/or video to listeners from all over the world. Interact with your audience in real-time via text chat and voice. Publicize upcoming shows, album releases, etc. Virtual world fans tend to be dedicated and loyal. Gain exposure across many social networks as your shows are promoted, reviewed, and blogged about. Enhance your performance with visuals, such as costume changes, light shows, etc. at minimal cost compared to real life events. If you can imagine it, you can create it. Earn $20 to $80 plus tips for playing a one hour show. You don’t even have to leave your home or studio. Market your CDs and merchandise to a new and enthusiastic audience. Setup costs are minimal; Second Life is free to join. You’ll need less than $20 to buy items for your avatar, and around $20/month for a Shoutcast stream if you don’t have one already. Virtual world performances don’t replace real-world gigs, but are a great source of supplemental income and a way to enhance your promotions on a global level, as well as being a lot of fun! We’ll teach you how to use Second Life, stream your music, and connect you with virtual music venues who will book you for concerts. Our services are provided at no charge, in exchange for you playing a series of concerts for no booking fee (tips only) at our virtual music venues. These shows will be heavily promoted throughout Second Life and other social media, and will help you to establish yourself and build an audience. Contact us today for more info!